Our next featured athletes need no introduction, but for formality sake they’re going to get one. Zak and Kim have a special place in all of our hearts. Quite possibly the sweetest couple you’ll ever meet, the Middleton’s have recently changed that moniker from “couple” to “family” with the new edition of Tyler. Video game creator by day, Zak is known as the in-house freak of nature at NWCF. He was a member of the championship winning 2009 CrossFit Games Affiliate Cup Team and can be seen around the gym lifting heavy things with one arm or while sitting on the ground. Kim spends her workdays as a doctor in Physical Medicine and Rehabilitation. After a long day of helping people at the hospital, you can find her at the gym highboarding… multiple days in a row… as she demonstrated eariler this week by throwing down a triple crown by snatching the top spot on Monday, Tuesday and Wednesday! I might be off by a day, plus or minus, but there was a month last year where she highboarded about 27 days out of 30. Since they both always finish their workouts way before everyone else, we were able to get them to answer a few questions while the rest of us were only half-way through the WOD. Congratulations on baby Tyler! What has been the biggest change in your daily routine since his arrival? K: Learning to think in 3 hour blocks for his next meal and diaper change, anticipating what he might need, and planning accordingly. Z: Kim and I are spending a lot more time together, either going on walks with the stroller or just having dinner and watching TV and playing with Tyler. We were always close with each other before for sure, but working together to raise a baby has certainly drawn us closer than ever. Zak, it’s only been a couple of months since Tyler’s birth and you look stunning. How’d you get back into shape so quickly after 9 months of pregnancy? Z: Well, working out through the whole pregnancy certainly helped. I had the support of lots of friends from the gym, and of course my wife helped me through it. Kim, do you think that Tyler will inherit your brains, charm, good looks and athleticism, or will he end up like Zak? K: Well, he’s currently in the 90%ile for height so clearly he’s taking after me. But he tends to smile at the girls so I think Zak’s influence is already setting in. 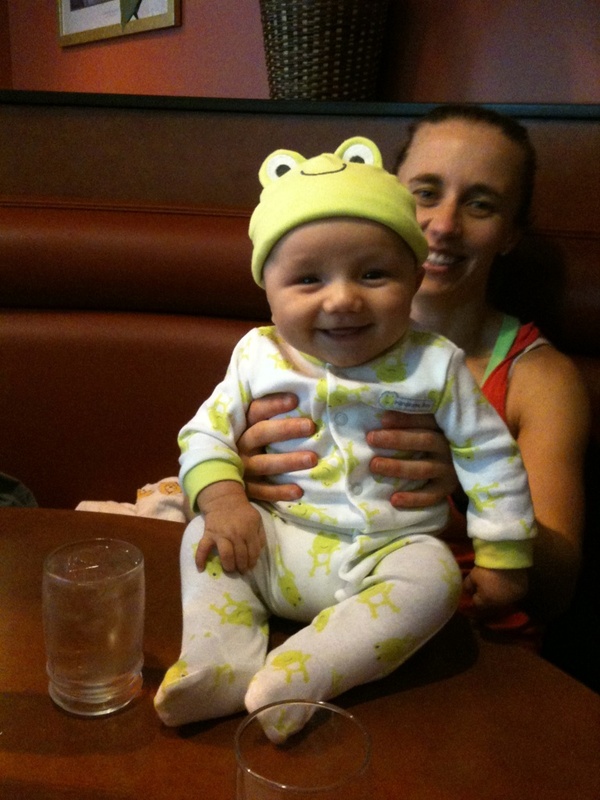 We understand that you guys have already begun preparing Tyler for the 2029 CrossFit Games. How is his training coming along? When can we expect Middleton Baby 2.0? Z: I’m just waiting for Kim to say the word. In the meantime I’m happy with the practice we’re getting in. Rumor has it that you and the Reese’s (Jordan and Melissa) are in negotiations for a prearranged marriage between your yet-to-be-born daughter and their yet-to-be-born son, who will then have a child, creating a super-human that will rule the world. Can you tell us more about the details of this situation? All that we can say is that our first generation of offspring will be doing 1 min Frans, 20 min Murphs, and double Body Weight C&J by the age of 10. So whomever their paired up with for the next generation has a lot to live up to. K: We were in the same hall in our Freshman Dorm. During a dorm progressive, I was serving spiked smoothies from our room. He came by and merely said, “What??? You drink?? ?” and walked away. I thought he was SUPER cool (NOT!). But I saw him with his shirt off so I decided to give him another chance. Fortunately he came around and we had our first tennis date (though he beat me 6-0) and before too long we were going to parties together. While he “didn’t drink” he would help himself to mine! We started dating later that summer. What are your athletic backgrounds? Z: I grew up playing soccer, baseball, and tennis and in HS decided to focus on tennis, becoming top 15 in the mid-Atlantic region and competing in national tournaments. I also ran cross country my first year in high school and got my mile down to 5:15 freshmen year (that seems so long ago now and I don’t think I’m anywhere close to that now). I had some tennis scholarship opportunities for college but decided to pursue academics at Stanford which at the time was a top three Division 1 team, so tennis became more of a hobby. I actually met Kim through tennis as our first date in college so all that time paid off (I beat her 6-0 in our first and only match but fortunately she still kept dating me). Also while in college I practiced martial arts for 5 years. When we lived in LA, I played a lot of beach volleyball then once we moved to Seattle, we moved to the apartment building across the street from NW Crossfit. The rest is history. K: I grew up a tomboy, learning to throw a baseball and football in our cul-de-sac, playing tennis with my dad on the public courts, and running on the beach on the weekends. I ran track the first 2 years of HS. I was captain of the HS tennis team, and picked up long distance running in high school once my track commitment ended. In college, I did my first half marathon and in med school did two marathons (LA and San Diego). I kept up tennis as a hobby, being soundly defeated by my future husband. I picked up CF after I saw how much Zak enjoyed it. When and how did you get introduced to CrossFit? Z: We already kind of covered that, but I do remember coming home the first few times being barely able to walk, and lying on the floor for about 10 minutes with Kim asking, “Are you ok?” I thought I was in pretty good shape, but I knew that something that could make me feel that wiped was worth sticking to. K: We lived in the apartment building across from NW CrossFit in Greenlake, and would wake up on weekend mornings to loud music and people doing ridiculous things like throwing big heavy balls against the wall. After Zak started going, it was all he could talk about. If I wanted to be able to understand his conversations about Annie, Fran, and Diane without getting jealous, I figured I’d better join! Got any vices? Maybe one that rhymes with sandy born. K: You got me Darren –it was candy corn until I was 5 months pregnant. Somehow my palate has changed. Since, I’ve dabbled in jelly bellys, licorice, and animal crackers, still not entirely settled on my newest obsession. Z: Nutella. I had it everyday for lunch in first grade when I lived in France and I’ve liked it ever since. K: Rain City Burgers with Sweet Potato Fries! Z: Anything grilled by my dad, followed by my mom’s apple crisp. When not at the gym owning the highboard, what else do you guys do for fun? K: I run the lake, watch 24 on Netflix, and play with Tyler. Z: I used to play a lot of video games. Now most of my time is spent being a dad. I wouldn’t have it any other way, every time he smiles it’s worth it a hundred times over. K: I was so intimidated with CF when I started and envisioned being called out to do Box Jumps in front of a crowd. So, before I started, I practiced on our living room furniture to convince myself I could do at least 16 inches it before showing up the first day! Z: I have credits on 5 video games and my name on 3 patents. K: MURPH! Pull ups and running! Z: Elizabeth, if I had to choose, or maybe King Kong. Anything with lots and/or heavy squat cleans. I don’t really get that excited about some of the big-name benchmarks, but I guess the mental game is a big part of success in CrossFit. K: Anything with OH squats for sure! (burpees over the barbell being a close second). Z: For benchmarks I’d probably say Fran, because of all the hype around it. I generally despise burpees, but that just makes it that much better to get them done when I have to do them. I also don’t like linking heavy push-presses in a workout because I’ve strained my neck that way before. Last question, and it’s multiple choice. Can we get a verbal commitment from the both of you that you will be competing in next year’s CF Games: Yes or Yes? Z: Ha, well I’d love to for sure, but I have to balance my passion for CrossFit with my desire to spend lots of quality time as a dad and husband. This year there was no way it was going to work and the choice was clear—next year it will just depend on how well other priorities are under control. K: If it was all bodyweight I wouldn’t think twice. But I have several Achilles Heels, namely OHS, Snatches, and anything over 95#. We’ll see what next year has in store for us! Easy enough, I’ll make a phone call to get those things sorted out for you both. There you have it folks, the Middleton’s will be competing in the 2012 CrossFit Games Open next year 😉 Zak and Kim, thanks so much for taking the time to let us get to know you even better! If you didn’t get enough “Middleton” to quench your thirst, check out these oldies-but-goodies from the archives. 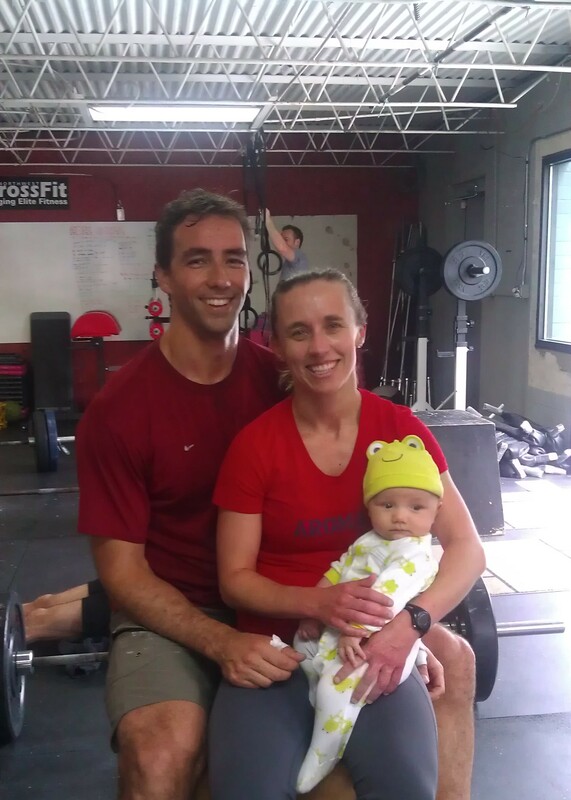 Zak power cleaning 198# with one hand, and Kim making a WOD look easy while 7 months pregnant!